What is Export of Goods under GST? a) As per IGST Act Section 2(5) Export of goods with its grammatical variations and cognate expressions, means taking goods out of India to a place outside India. Export means trading or supplying of goods and services outside the domestic territory of a country. What is Export of Services under GST? f)Supply of services having place of supply in Nepal or Bhutan, against payment in Indian Rupees is exempted even if the payment is received in Indian Currency looking at the business practices and trends. b) he may supply goods or services or both, subject to such conditions, safeguards and procedure as may be prescribed, on payment of integrated tax and claim refund of such tax paid on goods or services or both supplied. As per provisions of sub rule (1) of rule 89 of the Central goods and service tax Rules, 2017.
e) “Adjusted Total Turnover” means the sum total of the value of- (a) the turnover in a State or a Union territory, as defined under clause (112) of section 2, excluding the turnover of services; and 69 (b) the turnover of zero-rated supply of services determined in terms of clause (D) above and non-zero-rated supply of services, excluding- (i) the value of exempt supplies other than zero-rated supplies; and (ii) the turnover of supplies in respect of which refund is claimed under sub-rule (4A) or sub-rule (4B) or both, if any, during the relevant period. (F) “Relevant period” means the period for which the claim has been filed. Any person claiming refund of any tax and interest, if any, paid on such tax or any other amount paid by him, may make an application before the expiry of two years from the relevant date in such form and manner as may be prescribed: Provided that a registered person, claiming refund of any balance in the electronic cash ledger in accordance with the provisions of sub-section (6) of section 49, may claim such refund in the return furnished under section 39 in such manner as may be prescribed. The normal refund application in GST RFD-01 is not applicable in this case. (b) the applicant has furnished a valid return in FORM GSTR-3 or FORM GSTR3B, as the case may be. Thus, once the shipping bill and export general manifest (EGM) is filed and a valid return is filed, the application for refund shall be considered to have been filed and refund shall be processed by the department. Since the system of filing of return in FORM GSTR- 3 has not started so far, the refund of integrated tax on export of goods would be granted based on FORM GSTR-1 and FORM GSTR-3B for the time being. 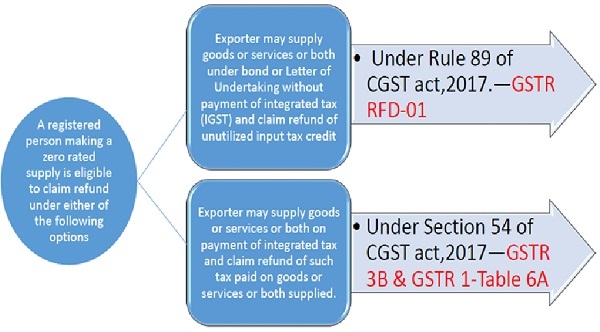 The details of the relevant export invoices contained in FORM GSTR-1 (or Table 6A thereof ) shall be transmitted electronically by the common portal to the system designated by the Customs and the said system shall electronically transmit to the common portal, a confirmation that the goods covered by the said invoices have been exported out of India. a) Form RFD-01 is filed when exporter is claiming for GST Refund as per sub rule (1) of rule 89 of the Central goods and service tax Rules, 2017 read with Section 16(3)(a) of IGST Act 2017. Net ITC means input tax credit availed on inputs and input services during the relevant period. It however does not includes ITC on capital goods therefore he cannot apply for refund of ITC paid on capital goods. c) However ITC on capital goods can be utilised when exporter is claiming for GST Refund as per Section 16(3)(b) of IGST Act 2017 i.e. 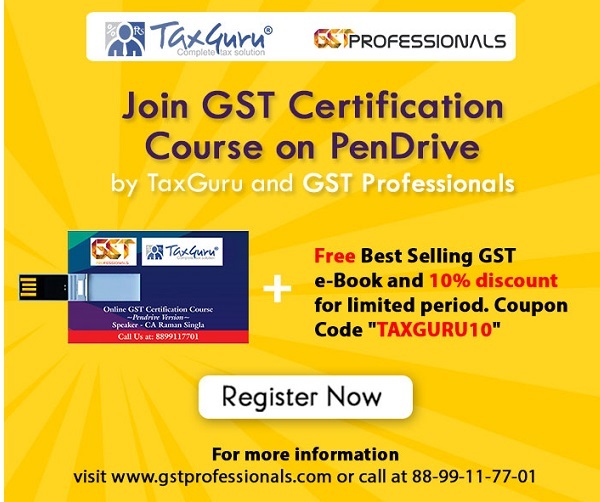 after payment of IGST taxes read with section 54 of CGST act,2017. d) Therefore in absence of any clarification from Government one should not file RDF-01 for claiming ITC refund of capital goods without payment of integrated tax. b) That if Claimant supply goods or services or both, on payment of integrated tax and claim refund of such tax paid on goods or services or both supplied. So he will file shipping bill/ export manifest and GSTR 3B & GSTR 1 and claim refund of Taxes paid on GST. “Capital goods” means goods, the value of which is capitalized in the books of account of the person claiming the input tax credit and which are used or intended to be used in the course or furtherance of business. So as per above case law one can argue with Commissioner of GST for refund of Capital Goods, if same is not capitalized in books of Claimant. However one can also argue for the difference in provision of law, where one allowed ITC on capital goods where other restrict the refund on same. Which ultimately lead to affect the working capital of Exporter.